This is another excellent recipe from Jason Atherton’s Gourmet Food for a Fiver. It’s a simple but extremely elegant dish that’s dependent on the quality of the base ingredients. This essentially translates as ‘use the freshest fish possible’. The fish in question is sea bream. Sea bream is widely available in the UK, and it’s one of our more sustainable catches, with healthy stocks around Cornwall and North Western and North Wales. It’s a delicately flavoured white fish that’s easy to fillet and simple to cook. Line caught is best, but other methods using fixed nets with measures in place to deter other marine animals are widely used. Sea bream also lends itself well to farming. Sea bream is on fishonline.org’s ‘Fish to Eat’ list. Equally importantly, it’s also cheap – a whole fish will set you back about £3, and should be enough to serve two. The mildness of the fish in this dish is countered with a zingy chutney. Put 40g of brown sugar, a tablespoon of honey, 40ml of rice vinegar and a cinnamon stick in a pan and stir and heat until the sugar has dissolved. Add four medium tomatoes, roughly chopped, a tablespoon of chopped fresh ginger and half a teaspoon of cracked coriander seeds and reduce the heat to let the chutney bubble very gently, thickening and concentrating its flavours. This will take at least half an hour. When the chutney has thickened, fish out the cinnamon stick and add a tablespoon of chopped mint. Season well with salt and pepper. Next, the pak choi. Wash the leaves from two heads of pak choi and dry with a kitchen towel, then wilt the leaves in a hot frying pan with a glug of olive oil added. The pak choi should just be starteing to catch, light brown marks appearing on the white stems. Season well. To cook the fish, heat two tablespoons of olive oil in a non-stick frying pan until the pan is hot and the oil is just about to smoke. Season the fillets well and lay them in the pan, skin side down. Let the fish cook for two minutes, then flip it over and finish the other side for a minute or so. 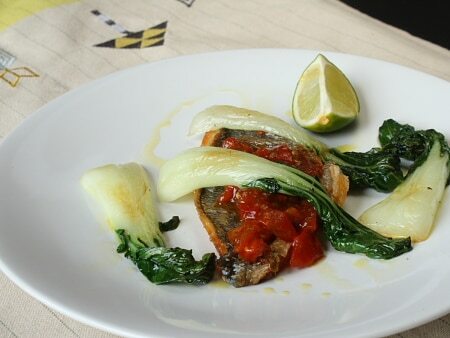 To serve, lay a cooked fillet of sea bream out on a warmed plate, spoon over a tablespoon or so of the chutney and arrange some of the pak choi around it. Add a wedge of lemon or lime and perhaps a scattering of chopped mint. This should be on the table in under forty minutes, start to finish. Sea bream is such a great fish to eat and cook with. I'm loving the recipe and that chutney sounds so good. Thanks for sharing this great recipe. Yum! This is one for Fiji! (Maybe not sea bream though….will have to let you know what I find.) I often feel 'homesick' for England when I look at your blog, Rich. Duck? Hahaha! Anyway. I will try this one.